If Quantum Predictive Model is accessed from R&D, the Runner must reveal it. If the Runner is tagged when Quantum Predictive Model is accessed, add it to your score area. Something to know about this before going ham with the combos, is how this interacts with other cards, and why. The first thing to know, which I had needed to get clarification for, is that "the order the conditions are written on the card matters", which is to say, "If A when B then C" is not the same as "When B then C if A"
Specifically, if it's written "If A when B then C" then the ability does not resolve when B happens if A is not true, meaning any effect that changes A during resolution of triggers for B is too late, whereas if it's written "When B then C if A" then A is checked at time of resolution. It is also worth noting the interactions with Film Critic and Maya as well. On the runner's turn Film Critic can host QPM first, as the runner's abilities resolve first on their turn, invalidating the access trigger, nullifying the other on access abilities. Maya has the different trigger of "After you access a card", so it will always resolve after QPM, however, Maya can still bottom the card, even if it's no longer in R&D, so if the runner accesses it, while tagged, you add it to your score area, then Maya can add it to the bottom of R&D, assuming you havn't won off the point. Note: I have re-written this review from it's original state, as I was incorrect about why it interacted the way it did with Casting Call, meaning I incorrectly assessed it's interaction with Film Critic, hence the first four comments saying that this is incorrect. Nice little potential 'trap' and something that tag me runner decks may be regretting that they ran themselves full of tags besides for upon finding it. This card works best in NBN kill decks. The basic strategy is to tag the runner with Midseason Replacements, ideally with so many tags that the runner cannot practically remove them. Once this happens, the game comes down to a race- the runner tries to assault R&D for the scoring win before the corp kills them! As this R&D assault happens, reveals of this card result in a score for the corp rather than the runner. The key point is that the agenda can't be scored by the runner, rather than that it is scored by the corp. Most of the time the corp is drawing for the killing combo and is not trying to win by scoring. So the card really delays the runner scoring out. As a result of the above, Film Critic does somewhat hurt the potential of the card since it can void its main ally, Midseason Replacements. With the recent move to 24/7 News Cycle as a killing medium, the number of tags landed is generally reducing, and thus the runner is less likely to retain multiple tags for long. Having said that, this card is wonderful against the current Data Leak Reversal runner decks, which tend to tag themselves as part of their attack combo. Such decks can help the corp to win on points by accessing this card. Combined with the Haarpsichord Studios: Entertainment Unleashed ID, multiple agendas in remote servers can help mitigate the mass milling strategy and give the corp a reasonable chance of scoring out. I will definitely be using this agenda in any NBN deck I build with tagging in mind. 3/1 agendas are normally in an awkward position since each faction has a 1 pointer that only costs 2, and 3 advancements could instead get you a 2 pointer (In NBN's case Project Beale, or 2 points and an easier future agenda with AstroScript Pilot Program). 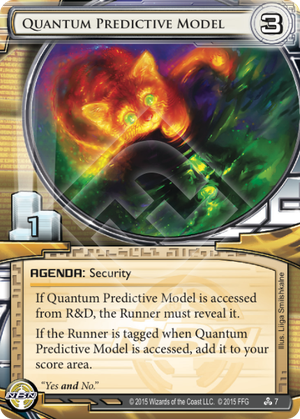 However, the great thing about Quantum Predictive Model is when you are using a tag storm deck it becomes something the Corp usually wants but can't have: a safe agenda. There are still a lot of stubborn runners out there that float tags instead of getting rid of them. This card punishes them for that. If the runner is double tagged, Quantum Predictive Model becomes safer than NAPD Contract, requiring 2 clicks and 4 credits to be allowed to steal it again, then they still have to make the run. Beyond 2 tags though, it just keeps getting better. If the Runner is too far into the eye of the tag storm, they may never have any hope of stealing Quantum Predictive Model. Best of all, even if they have given up on taking Quantum Predictive Model, they can still accidentally give it to you for free by accessing it from R&D. Who cares about it increasing your agenda density if the Runner can't steal it anyway? Of course, it isn't perfect. If the Runner has a better answer for tags, or if your tagging ability isn't as good as you thought when building the deck, you're going to regret picking this over some 3/2 agendas. But ultimately, I think it's a welcome addition to NBNs toolbelt.